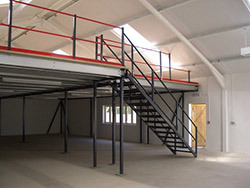 A storage platform mezzanine floor is exactly as it sounds, a mezzanine floor used for storage purposes only. It is the ideal solution to maximising the space you have available. So instead of moving premises, you use the area above you instead – creating additional floor space from wasted space above your existing working areas. Hampshire Mezzanine Floors offer you the complete fit-out covering all elements of the project from start to finish. We are able to provide the full turnkey solution, with a diverse range of products and services to meet all your needs. When it comes to planning a suitable layout for your storage platform mezzanine floor requirements, our project team will maximise space utilisation and ensure your design is both cost effective and practical. Hampshire Mezzanine Floor provide computer aided, state-of-the-art CAD mezzanine floor design drawings to help our clients choose the best solution for your particular needs. Hampshire Mezzanine Floor do not cut corners when it comes to mezzanine floor design and all aspects from safety to ergonomics are considered. Many projects require Building Control and possibly Planning Approval. Hampshire Mezzanine Floor administrate all your Building Control Applications and Planning Applications on your behalf saving you valuable administration time. When it comes to planning a project, Hampshire Mezzanine Floor provide a clear and concise schedule of works detailing the start and completion dates. All work undertaken is project managed by our project team. Hampshire Mezzanine Floor mezzanine floors conform to BRE Digest 437, relevant British Standards, and the latest Building Control Regulations. Hampshire Mezzanine Floor also have a comprehensive insurance policy in place with £5,000,000 Contractors’ All Risk policy insurance. This large amount of cover provides you with complete peace of mind. HMF have accreditation with the British Standards Institute to ISO 9001:2008 so that Hampshire Mezzanine Floor can provide and maintain a consistently high standard of work in all tasks undertaken. Hampshire Mezzanine Floor have a good reputation for customer care and quality of work. 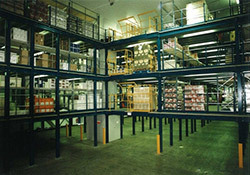 For further information on mezzanine floor design or a storage platform mezzanine floor, please contact us.